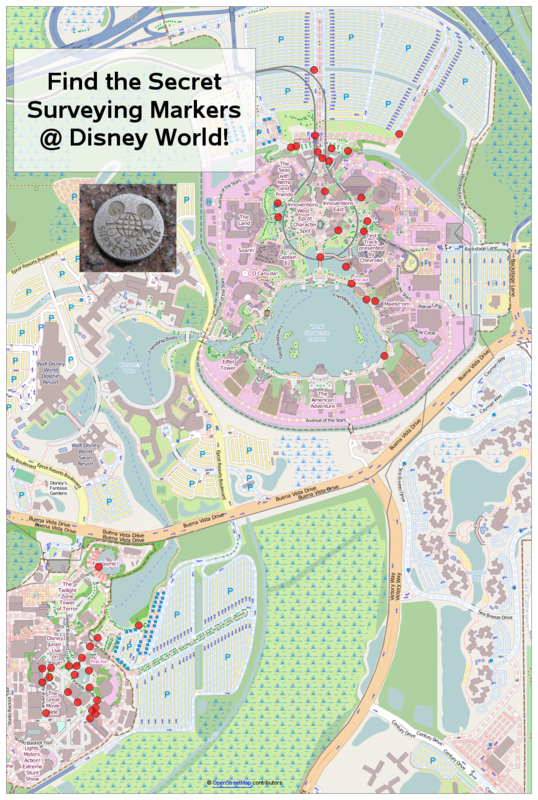 Something for geeks and nerds to do at Disney World! Are you one of those people who get easily bored at amusement parks? Would you like something to do while your friends/family are waiting in line for a ride? Perhaps I have an alternate idea, to keep you busy - survey markers! When surveyors are measuring and marking areas for construction, they sometimes install permanent survey markers in certain locations, so they can use them as reference points for other measurements, etc. 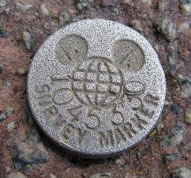 Here's an example of a survey marker that was used at Disney World. Wouldn't it be cool to find some of these markers? How do you find survey markers? How do we make sense of the location data? 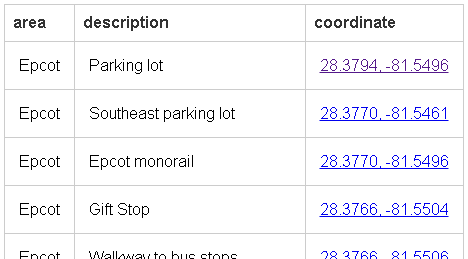 I downloaded the marker location data, and imported the latitude/longitude coordinates into SAS. I then created a scatter plot of the coordinates, and added a map image behind them. Of course 'the devil is in the details' as this entailed downloading several slippy map tiles and piecing them seamlessly together, and then combining the map and scatter plot in such a way that the markers appear in the exact correct location on the map. When viewing the interactive version, the red markers (which represent the survey marker locations) have mouse-over text, and you can click on the red markers to bring up a Google satellite map zoomed-in on that exact location. Looking at the zoomed-in satellite map should give you a pretty good idea of where to look for the marker. Below the map is a table showing all the markers, and their lat/long coordinates in text form (below is a screen capture showing the first few lines of the table). If you're a real crackerjack, you could enter the lat/long coordinates into your gps (or smartphone) and have it take you right to the spot. What to do once you find one?!? There is an app called Glympse which you may enjoy for tracking yourself or letting others know where you are. https://www.glympse.com/ I was thinking of using it so folks could watch me fly from Ottawa to Orlando. I enjoy some cell phone games that integrate with gmaps in an exercise game and have an eposter on game statistics from one of these games.. See it at SASGF. I love geocaching and this is super cool! Enjoy your continued "treasure" hunt. You haven't been to an Orlando SUGI/SGF in 20 years? Are you going to be there this year? If so, maybe you should create a live interactive map showing where you are at all times so those of us you've helped over the years can thank you in person! Yep - I'll be there this year! I have one at the end of my driveway at home. Not a Disney marker. Dude, love the marker post! I've found several, and yes, weirdly have my favorites. But MGM has long been renames to Disney's Hollywood Studios (DHS). Oooohhhh I'm even more excited to check out the parks now! Thanks for sharing.